Once you have your mural in place, let the colours within it guide the room's scheme – balance and restraint are key when you have something so impactful on your wall. Most of the designs are easy to put up – either ‘paste the wall’ or traditional adhesive – so you can transform your room within hours. Use our guide to find the best mural for you rooms – and don't miss all our design guides on our dedicated hub page. Still loving dark and brooding interiors? Yep, us too, and we can't get enough of this living room. The expansive mural is a copy of the iconic painting, Vase of Flowers by Dutch artist Jan Davidsz de Heem. We reckon something this dark would work best in a room that has enough natural light to balance the dark tones; use plenty of colour to lighten the space. Vase of Flowers mural, £36 per m2, Murals Wallpaper. Oscar two and a half seat sofa in Claret, £2,440, sofa.com. Kahrs Classic Oak Nouveau flooring in charcoal wood, £69.99 per m2, Carpetright. Love this? Find more statement living room wallpapers in our design guide. Keep children's imaginations flowing with a mural that looks like something straight out of a book. This exquisite mural from Sian Zeng has been reproduced from a Chinese inspired hand-painted work and will fit on any wall due to its repeating panels. It also comes in a dreamy pale grey (which we think would be totally fabulous in an adult bedroom). Classic Hua Trees mural wallpaper in pink, panel prices start from £80, Sian Zeng. See more wallpaper ideas for kids' rooms. If you'd like to create a display of books to add texture, colour, depth and character to your room but would love to take a short-cut to get it, a library mural is the way to go. This Natural Bookcase mural by Wallsauce is made-to-measure and costs from £30m2. Create a focal wall in a home office or kid’s bedroom with this made-to-measure map of the world mural – it might even help them with their geography homework! You can even crop a certain area if you don’t wish to choose the whole world. Brightly coloured and bold, it certainly creates an impressive backdrop and works brilliantly with white and mid-toned wood furniture. World white flags map wallpaper mural by Lovell Johns, from £30 per m2, Wallsauce. Pretty pastels in geometric shapes – what’s not to love? This striking mural is made up of four coloured and textured blocks, and comes in a six easy ‘paste the wall’ panels. The pale wood flooring and candy coloured sofa give a Scandi feel to this look; recreate yourself by choosing a similar colour palette. Geo wall mural, from £120; can be custom made to fit your space; from £195, Woodchip & Magnolia. Love this look? Find more ideas for colour blocking in our design feature, and don't miss these geometric wallpaper design ideas. Create a harmonious bedroom under the palm trees with your own tropical urban jungle. Soothing greens and pastel pink are two colours that are easy on the eye and calming to boot. Accessorise with succulents, trailing house plants, botanical cushions and vases full of exotic flowers to complete this on trend look. Find more botanical wallpapers in our design guide. Bedroom under palm trees mural, from £218, Pixers. Taken from an original painting in plaster and ink, this striking Chinese tree will give maximum impact in a large space. A living room or bedroom would suit this painterly style and colours, and it can be hung in repeat, used with dado and picture rails and cropped to suit all ceiling heights. Pick out cushions and accessories in the two main colours – blush pink and mustard yellow – to tie the look together. Chinese Tree in blush mural wallpaper, £395, Anna Jacobs Art. Love this look? It's inspired by maximalism – check out our feature to see more. Who wouldn’t love a 1:1 scale polar bear swimming into their bedroom? This stunning image is made to measure and you can have extra blue strips each side of the bear if your wall is wide. Easy to install, it comes with a self-adhesive backing and can be placed over a normal painted wall and be repositioned. Ideal for a boy who can’t decide on a paint scheme and wants to surprise his friends next time they visit! Arctic polar bear self-adhesive wallpaper mural, from £129, Oakdene Designs. Murals are not just for living rooms and bedrooms, they can look fabulous in kitchens too. 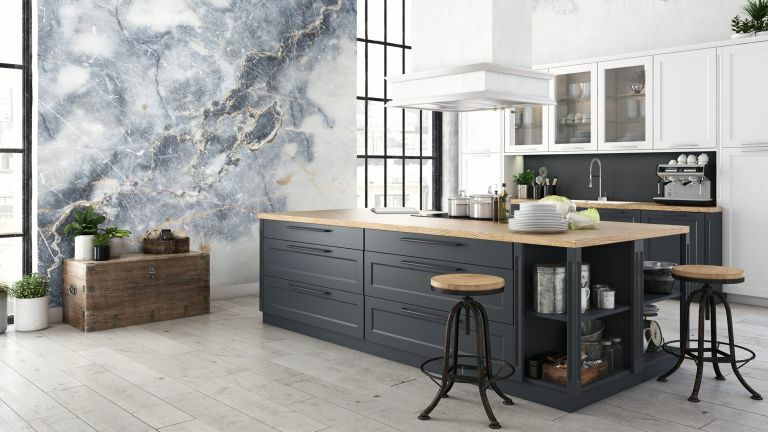 If you are doing up a kitchen on a budget and that fabulous marble worktop is way out your price range, get this mural on your wall instead! Why not just completely steal this look and combine it with dark grey painted units and warm toned wood? White marble wall mural, £30 per m2, Wallsauce. Love grey? Find more grey wallpaper ideas in our design feature. Create your own optical illusion with this all over pattern of pretty pink blossom. This particular design will work in both modern and more traditional settings. Team with black pendant lights and sleek furniture for the former and curvy style furniture and classic accessories if your home is a period property. To keep the look balanced and not too full-on, simply have it on one wall and paint the rest in a plain, complementary colour. Oasis mural, £179.95 per panel, from the Oasis Wallpaper Collection, Galerie Wallcoverings. Opting for a mural with a layered design and assortment of patterns is a great option if you're looking to add texture to a space. We love this Winter Hills Mural from Wallsauce, with its combination of earthy browns, greens and pops of gold. It creates a great focal point in a space and should be paired with accessories in a similar tone. Tired of white and cream, and ready to give a mural a go? Experiment with calm shades of green and abstract motifs. Sage or mint green are especially suitable for a home office, while a deep forest green would work in a bedroom. The Pseudo Sage Watercolour Wallpaper Mural is from MuralsWallpaper. Planning a complete home office overhaul? Check our our inspiring home office design ideas. Orange is making a comeback this season, and that includes the walls. The key to making orange work is to pick a slightly dusty coral shade. A great way to update a room that has lost its mojo (boring bathrooms, we're looking at you). We like the Coral Reef Pattern Wallpaper Mural from MuralsWallpaper. Check out more colourful bathroom design ideas. Introduce a bespoke, playful element to your bathroom with a monochrome wall mural. To keep the design scheme smart, keep the colour scheme of the bathroom furniture monochrome too. Looking for more wallpaper inspiration?